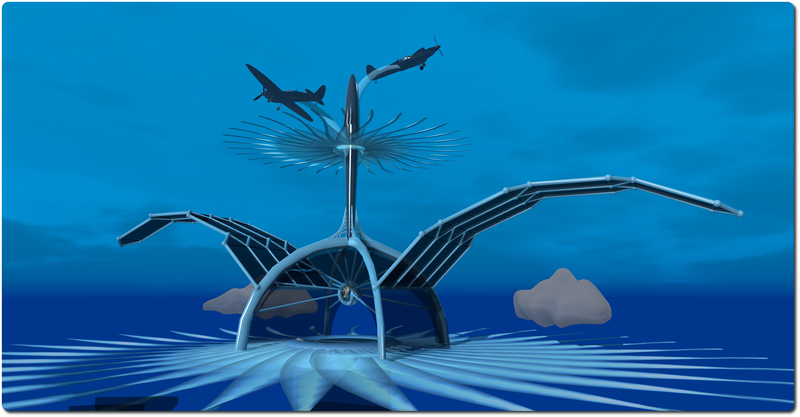 Opening on Wednesday May 21st at 13:30 SLT is a new 3D art sculpture by London Junkers entitled A Dream, the Wings to Fly, located at the torno Kohime Foundation’s 3D Art Gallery and jointly sponsored by the torno Kohime Foundation and Tanalois Art. 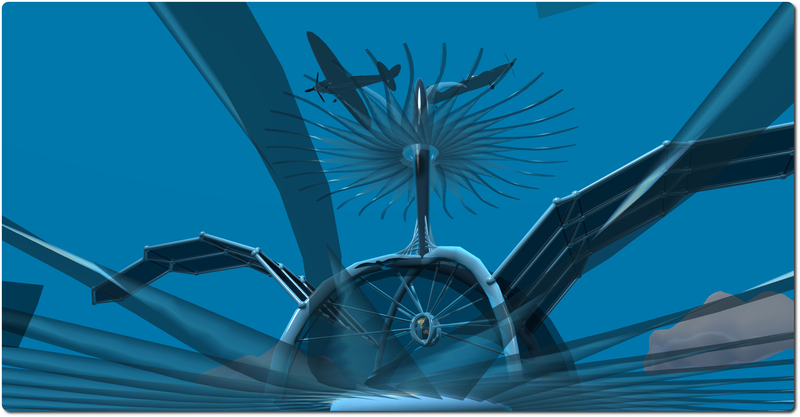 It’s a beautifully intricate piece, celebrating the history of aviation and flight. The central element of the sculpture is a jet turbine engine, the blades of which form the two main levels of the piece, connected by a stairway. On the upper section sits an exquisite build which richly encapsulates the dream and reality of flight. This starts with a sculpture of a bird in flight, the gentle arc of its wings reflected and exaggerated in the arc of the wings of the structure it flies before, and which themselves echo the long history of the dream of flight, when men sought to mimic the shape of a bird’s wing that they might also fly. At the base of this structure sits the simplest flying machine anyone can make: a paper aeroplane, while above it, continuing the jet aviation theme rises the central spindle of the turbine, passing through another set of turbine blades to support two Spitfire-like aircraft. But look again, because there is more to be seen here than might at first be apparent. See how the turbine blades are exaggerated in form, twisted into cloudy wisps. 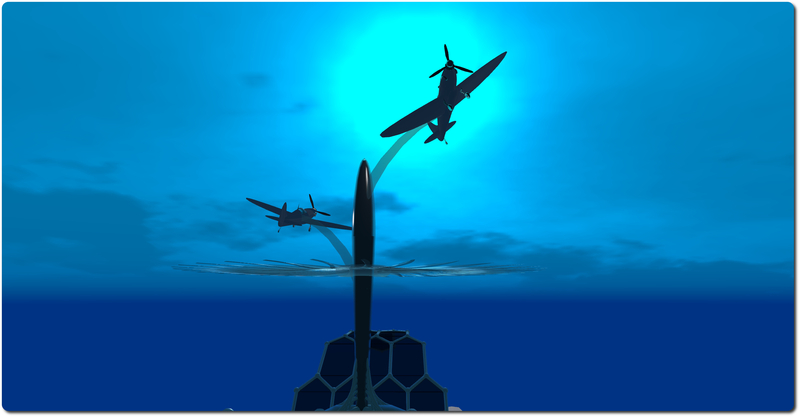 Look again at the central turbine spindle rising into the sky, note its shape and the four fin-like supports at its base; here sits not a spindle, but a rocket, pointing to the stars. And there, at the centre of it all, lies a small, glass Earth, richly symbolic in its placement. It is both the only home we have, a place which aviation and spaceflight have helped us to explore and map and understand as never before. The place our yearning to continue our voyages of discovery longs to one day slip. There are powerful echoes here: Da Vinci, du Temple, the Wright brothers, Whittle, Tsiolkovsky, Goddard and others; echoes perhaps best summed-up, giving the Spitfire motif, in the words of John Gillespie Magee, Jr.
Lizzie Gudkov, London’s SL partner tells me that London hopes the piece will encourage people who visit it to try their hand at flying in SL; that’s not an inappropriate aim. 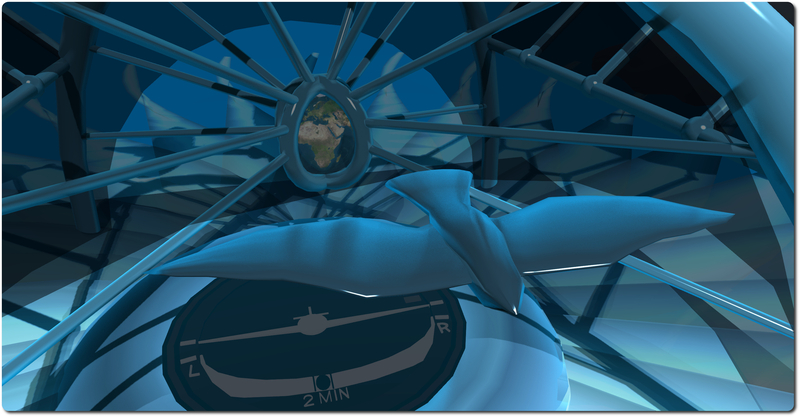 It matches both the aviation theme of the piece and reminds us that Second Life, with all its rich and varied opportunities, allows imagination to truly take to wing, allowing us all to slip the surly bonds of Earth. A simply beautiful piece, highly recommended to anyone who is either a lover of aviation or whose dreams encompass the freedoms we’re offered through SL. On Tuesday May 20th, the Main (SLS) channel received the server maintenance package deployed to Magnum in week 20.This includes a bug fix for a networking-related issue that sometimes affects busy sims. On Wednesday May 21st, the BlueSteel and LeTigre RCs remain on the Sunshine / AIS v3 server-side code, and receive the networking-related bug fix deployed to the Magnum RC in week 20 and to the Main channel on Tuesday May 20th – see here for details. On Wednesday May 21st, the Magnum RC should receive a new project, which includes changes related to the ‘Experience Tools’ project. The de facto release viewer updated on Monday May 19th to version 3.7.8.289922, formerly the Maintenance RC comprising fixes in Recent tab, Chat, LSL editor, land management, etc; GPU table updates; crash fixes & performance improvements – release notes here. A new Memplug RC viewer, version 3.7.8.289942 was released, containing a number of fixes for memory leaks which are expected to result in improved viewer performance and a reduction in crash rates. Simon also indicated that at some point soon (no date as yet), there will a few regions (most likely on Aditi, the beta grid) to try-out the new functions with the aim of seeing how the capabilities are used, how they get abused and then how SL behaves, so that some appropriate limits can be imposed to prevent deliberate or accidental abuse. 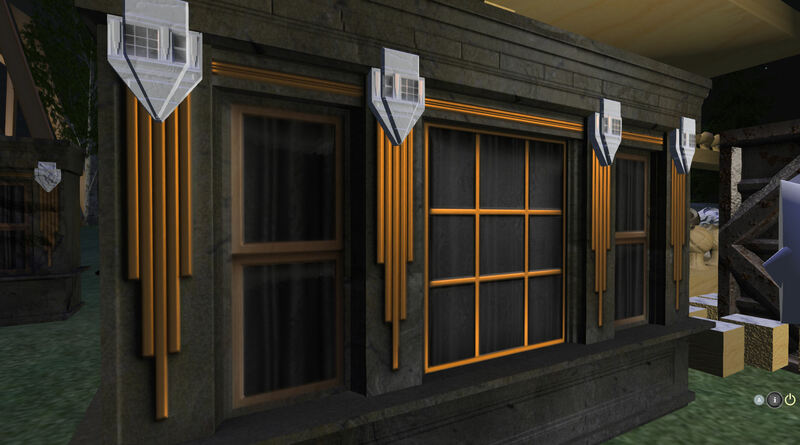 On Thursday May 15th, Linden Lab launched their line of new mesh avatars to something of a mixed response. Unfortunately, said avatars may have fallen a-foul of a long-standing rigged / fitted mesh rendering issue affecting people used AMD / ATi graphics systems with recent Catalyst drivers, and which sees rigged / fitted mesh stretching to the 0,0,0 coordinate of a region – see BUG-6065, which offers advice on circumventing the issue.